A topic of interest to readers of Forbes is the grocery industry and especially Instacart. It’s easy to write about Instacart due to the increased amount of press the company is receiving for its missteps in managing its workforce and the ever-growing realization that despite denials to the contrary, Instacart has every intention to become a competitor to the grocery retailers it serves. Although there are a myriad of reasons why grocery retailers became convinced it was to their benefit to contract Instacart, there is a the primary reason why grocery retailers should not: Many of the grocery retailers currently doing business with Instacart built their brands over a period of fifty years and in some cases over more than 100 years. Executives at these companies turned the future of their brands and their companies over to an internet startup ran by individuals with minimal business and grocery experience. Two words properly describe why grocery executives contracted Instacart: desperation and fear. Instacart has also created a reputational risk crisis for retailers who use its services as a result of implementing a new pay and tipping policy that reduced the amount of pay received by some workers to less than $1.00 per hour. Instacart is increasingly generating negative press stories. 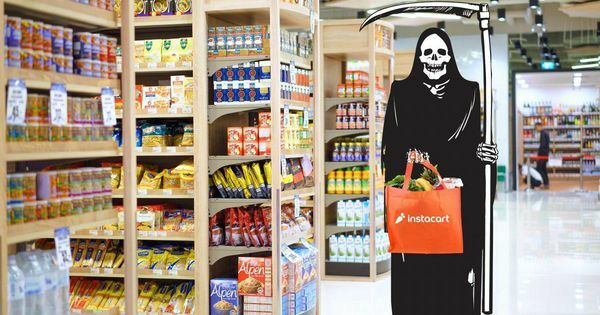 Is Instacart A Savior Or The Grim Reaper? When Amazon announced it was acquiring Whole Foods in June 2017, grocery executives were understandably spooked. Needing a quick and satisfying answer to board members inquiring about a plan to offer grocery fulfillment on the scale of Amazon Prime, executives saw a savior in the form of Instacart. With Instacart, they could compete with Whole Foods immediately without having to build their own infrastructure. To convince grocery executives to contract Instacart, the company made the argument that Instacart wouldn’t dare compete with any of the grocery retailers it serves. Executives bought Instacart’s argument hook, line and sinker and contracted the company for online grocery order fulfillment and last mile delivery. However, something interesting has become apparent as Instacart has increased the number of retailers using its services. Instacart has gained access to a tremendous amount of data, including customer data, and Instacart has become the face of online grocery ordering. More important, Instacart has learned the strengths and weaknesses of every retailer it serves as well as the grocery industry as a whole.